The Cameron practice pas uses the design of an inner wood puck, with a rubber casing. Are you ready to get serious about your pad? Offworld Percussion 'Outlander'. The choice of pipe band drummers and more bang for the buck than any other pad. Made with top materials including Darkmatter surface. This 9" pad offers a thin surface for a feel that compliments your pipeband snare head. This pad is made from some of the finest materials available and is a terrific value. Are you ready to get serious about your pad? Offworld Percussion 'Outlander'. The choice of pipe band drummers and more bang for the buck than any other pad. Made with top materials including Darkmatter surface. This 9" pad offers a Black VML surface (Vinyl/Mylar Laminate Surfacing). As an added bonus, it includes an Articulation Oval that can be used with the pad (Carbon Fiber) for enhanced volume and articulation. Are you ready to get serious about your pad? Offworld Percussion 'Outlander'. The choice of pipe band drummers and more bang for the buck than any other pad. Made with top materials including Darkmatter surface. This 9" pad offers a Gunmetal VML surface (Vinyl/Mylar Laminate Surfacing). As an added bonus, it includes an Articulation Oval that can be used with the pad (Carbon Fiber) for enhanced volume and articulation. The perfect pad for teaching, travel, workshops, playing on your drum, competition day and the craftsmanship is awesome. This pad comes with a Dark Matter surface and is sized perfectly to fit on your top head, snugly between the tension rim or on your lap. Please check out the video or let us know if you have any questions. This pad is a 'must have' for the travelling drummer. The RP-1R Pad measures 11.5" in diameter. It is a high quality pad made with a pipeband snare feel in mind. The pad includes a foam backing to keep it stationary while playing. The CP-1R Pad measures 11.5" in diameter. It is a high quality pad made with a hard surface feel in mind. The pad includes a foam backing to keep it stationary while playing. This pad has become a major favorite with bands in a short time. 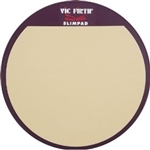 Vic Firth makes great stuff and this model pad is an example of top quality materials being used to provide a pad that feels like a pipe band drum. It's not too soft, and hard enough for a great practice session without hurting your arms. Light with a 12" base, and easy to fit in your pack.